Your car contains hundreds of different components for it to function correctly. Every engine component relies on each other which contribute to smooth operation of the engine. Out of the many parts and sensors in the engine, one component, which is known as the idle air control valve is critical to the engine. Its job is rather simple but crucial for the engine to run smoothly. The idle air control valve is usually installed in engines which are fuel injected. In carbureted vehicles, a similar device is present which is called the idle speed control actuator. The difference between the two is that the IAC is controlled by the ECU of the car, present in the modern fuel injected vehicles. In this article, we will go through how the idle control works, the most common symptoms of a bad idle control valve and the replacement cost. Like other sensors and components inside a car, the idle air valve does also go bad after years inside a hot engine space. It can either clog up or stop working at all. If that does happen, you will immediately notice that your car isn’t able to idle smoothly and even stalls at times. Also, your vehicle might stutter a little as you give gas. With a bad idle control valve, you may need to keep your foot on the gas pedal to keep the engine from stalling. Because the Idle control valve controls to make sure that your engine gets a smooth idle, a failed idle control valve will cause your idle to either jump up and down in rev or get stuck at a too high or too low RPM. You can also expect that you idle RPM will jump up and down. The engine control unit controls all sensors of your engine at real-time. If the engine control unit gets faulty values from any sensor, it will store it as a trouble code. If the problem is occurring several times, the engine control unit will light up the Check Engine Light on your dashboard. If you notice this, read the trouble codes with an OBD2 scanner. If the idle control valve gets stuck in a closed position, you may experience problems like that your engine will die on idle or that you have to give it some gas to keep it alive all the time. If you experience this, take the idle control valve apart and clean it. The Idle control valves can also cause your throttle body not to calculate the air entering the engine correctly. In some cases with these functions, you can expect problems at higher RPM’s also with a bad idle control valve. What is the function of the Idle Control Valve (IAC)? 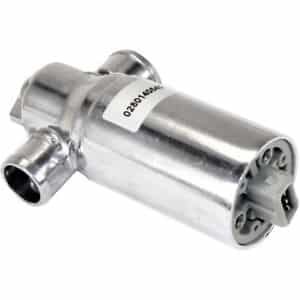 The IAC is a rather small device in size, and it’s a simple valve to control the air flow to the engine. The device is fitted in a way, between the air intakes systems that either lets a small amount of air go to the engine with the throttle closed or allows the throttle or butterfly valve take over the air flow to the engine. The idle control valve has a servo which pushes and pulls a plunger, with a cavity inside the body, which is either blocked or exposed as the servo pushes the plunger. The idle control is controlled by signals given by the car’s computer system which tells the idle control how much to move. The idle air control valve is there to let a small amount of air to the engine even when the throttle or the butterfly valve is shut completely. Why is the air idle control valve so crucial to the engine? To keep the engine running, the engine needs a constant supply of air to mix with the fuel. An engine idles typically at around 500 to 700 RPM which is essential as little fuel is required to keep the car running for longer without working the engine too much, and as a result, the engine produces less heat. To maintain the RPM ranging from 500 to 700 rounds per minute, The butterfly valve in manual vehicles or the throttle body in fuel injected vehicles need to close almost to the ‘completely shut off’ position. The positioning needs to be as accurate as possible so that the RPM needles doesn’t jump too much and stays constant for the most part. But the problem with the throttle or butterfly valve being almost shut is that the engine’s RPM won’t be constant and would need real-time adjustment to keep the engine running. That is because the air pressure varies as well as the temperature of the atmospheric air, which can cause variations for the engine. This can cause the engine to stall frequently. This is where the idle air control valve comes in. The throttle or the butterfly valve shuts completely blocking the air flow to the engine, but the idle control valve opens up slightly to let a small amount of air into the engine to keep it from stalling. 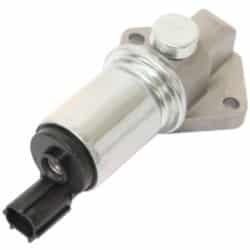 Moreover, since the idle control valve is controlled by electrical signals given by the ECU of the car, the ECU keeps giving the idle control valve signals to adjust according to the temperature of the air coming in and also the pressure of it, keeping the engine idling at the most optimum RPM levels. This allows the ECU to control the engine RPM using the idle control valve, irrespective of how much load is put on the engine. For example, if you switch on your air conditioning unit, your AC compressor will engage and put a bit of load on the engine by the belt driving the compressor’s pulley. That isn’t a problem if you are operating with an RPM of 1500 to 2000, but when you aren’t driving, and the car is at a dead stop, without the idle air control valve, the engine would die or begin to shiver heavily as soon as the air conditioning system is turned on. You would need to put your foot on the gas to keep the car from stalling. The idle control valve quickly adjusts the position of the plunger to allow more air into the engine, bypassing the throttle or butterfly valve, compensating for the power loss when the air conditioning is turned on. Just like that, turning the steering on a power steering vehicle will also put additional load on the engine which is compensated by allowing more air in by the idle control valve. Similarly, when the additional load on the engine is shed, this would result in the RPM going higher than 1000 rounds per minute. The idle control valve then adjusts to close the air inlet to the point where the amount of additional air is not needed. The replacement cost of an idle control varies depending on your car’s make and model, the valve may cost anywhere from $50 to $300. The valve is often pretty easy to replace and you can except a labor cost of anywhere between 50-250$ if you let a mechanic workshop do it for you. This component is small, but often you can clean and lubricate it if it gets stuck. Sometimes, the valve itself is working but restricted due to some debris stuck at the servo path which might be preventing it from moving freely. In that case, merely servicing the valve from the outside will do. Idle valve is often natural to remove which is why you should first inspect the valve for apparent signs of clogging or debris. If you find out, however, that the servo doesn’t move at all when given signals, it is time to replace it.